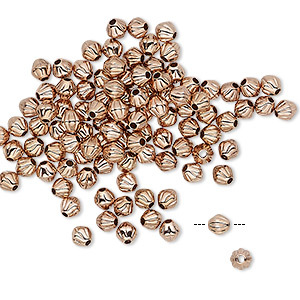 Bead, rose gold-plated brass, 3x3mm corrugated double cone. Sold per pkg of 100. 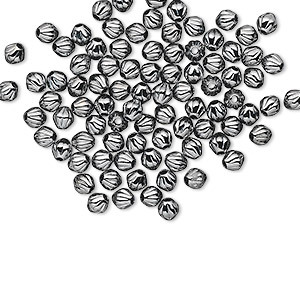 Rose gold plating gives these beads an attractive, soft glow. 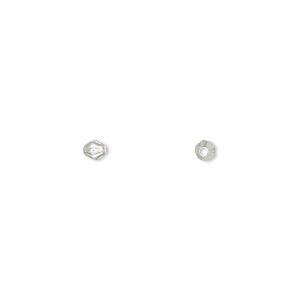 Their pinkish hue helps these quality components work in an expanded range of design color combinations, including such on-trend tones as Swarovski's crystal rose gold. 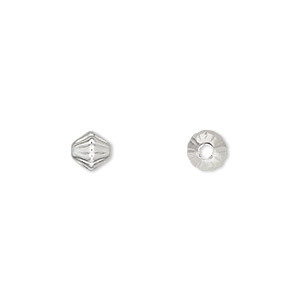 Bead, silver-plated brass, 3x3mm corrugated double cone. Sold per pkg of 100. Bead, gold-plated brass, 3x3mm corrugated double cone. Sold per pkg of 100. Bead, gunmetal-plated brass, 3x3mm corrugated double cone. Sold per pkg of 100. Bead, silver-plated brass, 4mm corrugated double cone. Sold per pkg of 100. Bead, gold-plated brass, 4mm corrugated double cone. Sold per pkg of 100. Bead, silver-plated brass, 7x5mm corrugated double cone. Sold per pkg of 100. Bead, silver-plated brass, 5x5mm corrugated double cone. Sold per pkg of 100. 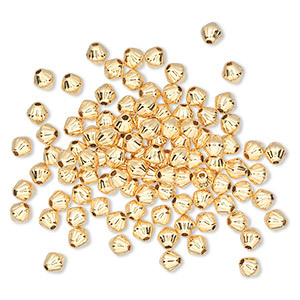 Bead, gold-plated brass, 5x5mm corrugated double cone. Sold per pkg of 100. 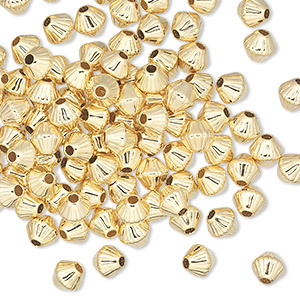 Bead, gold-plated brass, 7x5mm corrugated double cone. Sold per pkg of 100. Bead, silver-plated brass, 6x6mm corrugated double cone. Sold per pkg of 100.